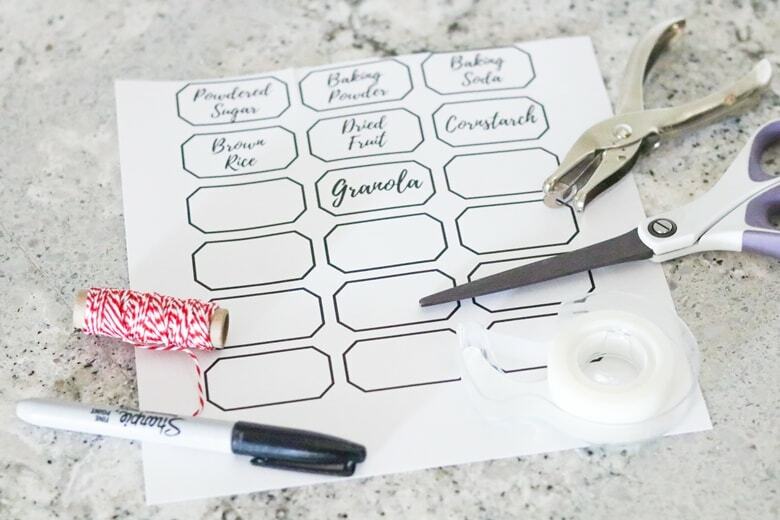 Tackle pantry organization with these 9 simple steps and downloadable pantry labels. 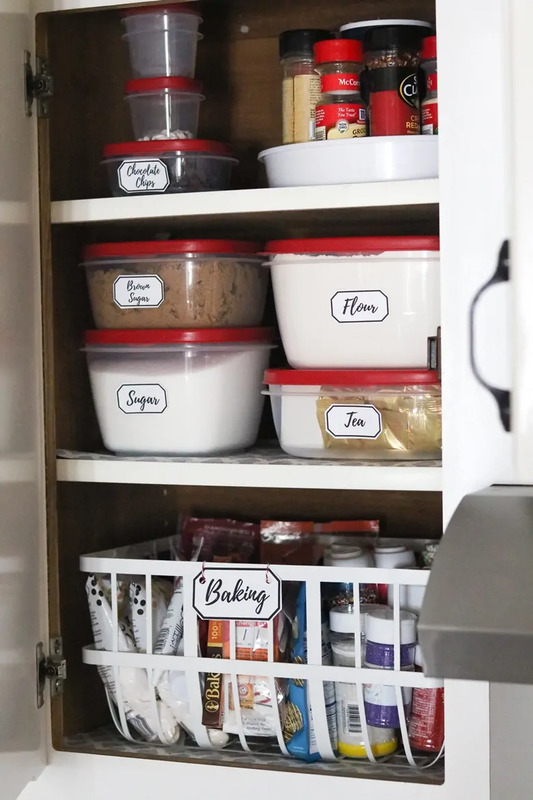 Plus, learn how you can enter for a chance to make your pantry organization dreams come true in the Rubbermaid® Easy Find Lids™ Pantry Makeover Sweepstakes! 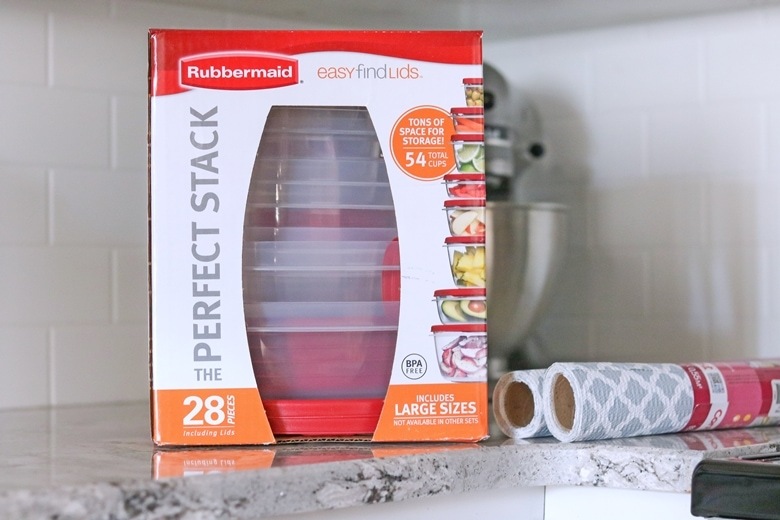 This week I decided to start my Spring cleaning by cleaning out and organizing our kitchen pantry with the help of Rubbermaid® Easy Find Lids™. An organized pantry not only looks nicer, but it makes food prep so much easier. It helps save time by making it easy to find and grab whatever hat you are looking for without having to dig and move things around. Unfortunately, our kitchen is small and lacks a proper pantry. So instead, I have dedicated 3 of our kitchen cabinets as our pantry space. It has been well over a year since my last pantry cleanout, so my poor pantry was just begging for some attention. I also wanted to share my pantry cleanout and organization steps with you, so that you can organize your pantry and get it crossed off your spring-cleaning list as well. 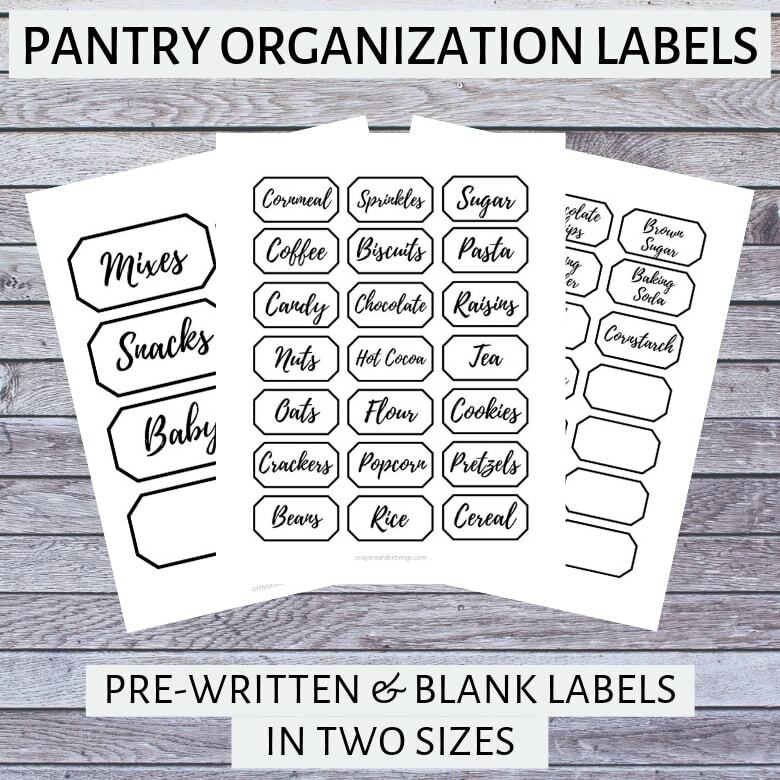 If you would like you can even download and print out the pantry labels that I created to use them in your own kitchen! Rather have someone else tackle your pantry? 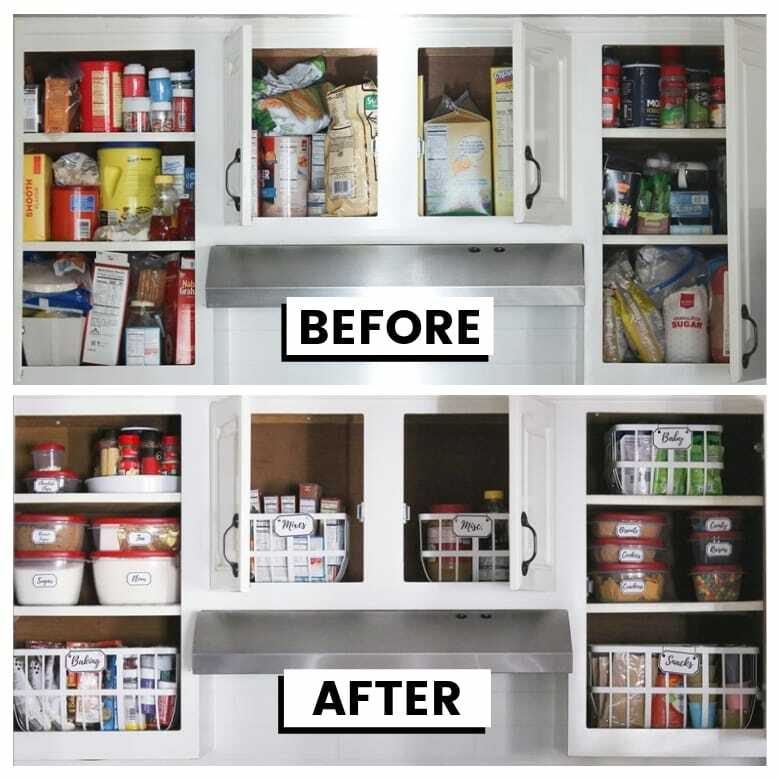 Enter the Rubbermaid® Easy Find Lids™ Pantry Makeover Sweepstakes from March 17 to May 5 for a chance to win a pantry makeover valued at $5,000! 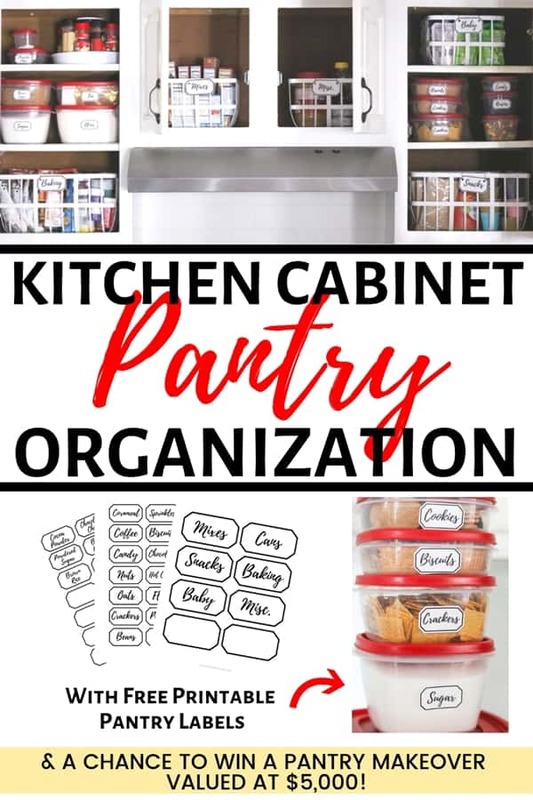 Tackle pantry organization when you have a few hours available to dedicate to the task. 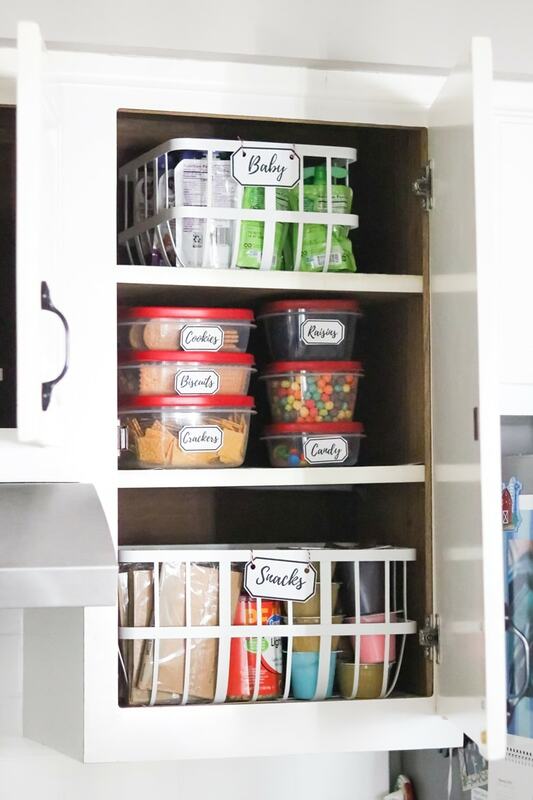 Because in all honesty, organizing your pantry is going to take some time. This isn't the sort of task that you can leave half done and come back to later. 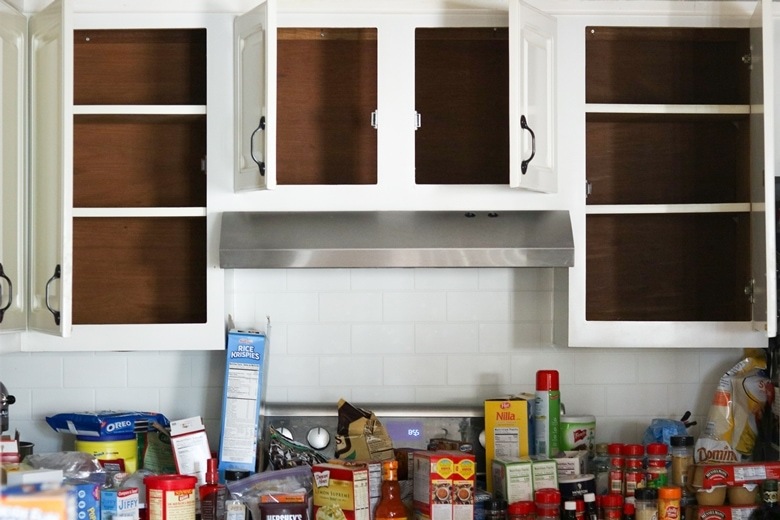 Start by taking every single item out of your pantry cabinet and place them on a nearby table or countertop. While you have your cabinets emptied, give them a quick vacuum and wipe down to clean out any crumbs or spills. With a trash can nearby, check each item's expiration date. Toss anything that has expired. Shelf liner makes cleaning up spills and sticky messes much easier, especially on old particle board shelves like mine. Adding shelf liner is easy. 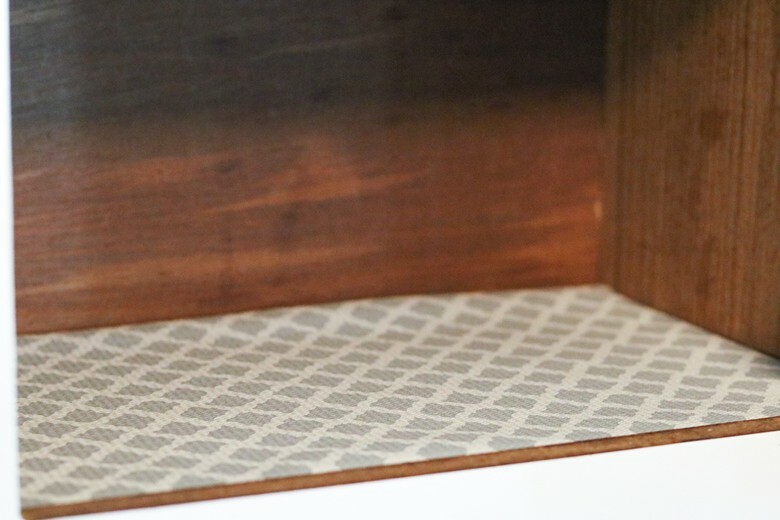 Simple measure your pantry shelves and cut the liner to fit your shelves. If you already have shelf liner, check to see if it needs to be replaced. If not, just be sure to give it a good wipe down. A lazy susan is perfect for storing spices and seasonings. Lazy susans make it easy to find the spice that you are looking for, even if it is all the way in the back. Transfer as much as possible into airtight containers to help keep your items fresh as long as possible. 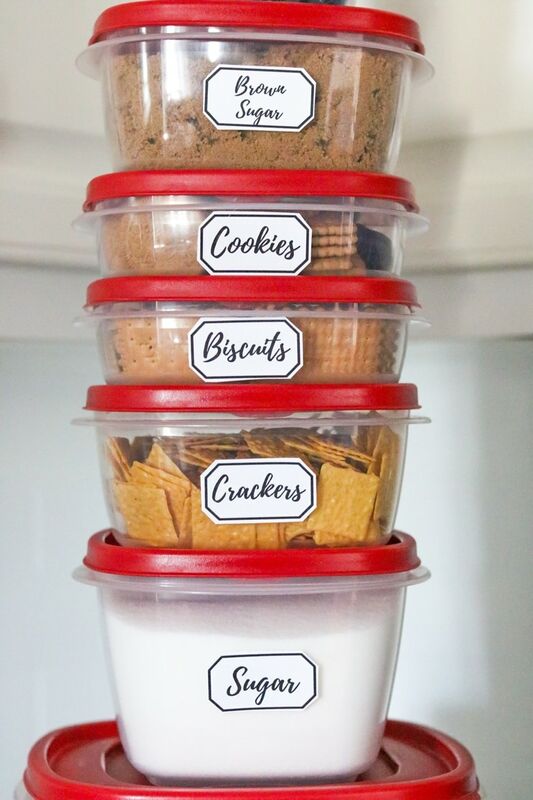 I recommend Rubbermaid® Easy Find Lids™ containers — I used them for my pantry update and couldn't be happier. 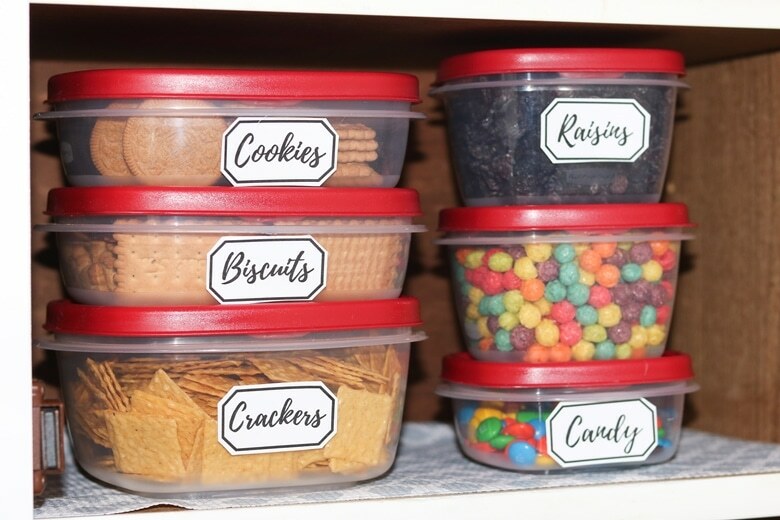 Rubbermaid® Easy Find Lids™are perfect for pantry organization. With Rubbermaid® Easy Find Lids™, lost lids become a thing of the past. 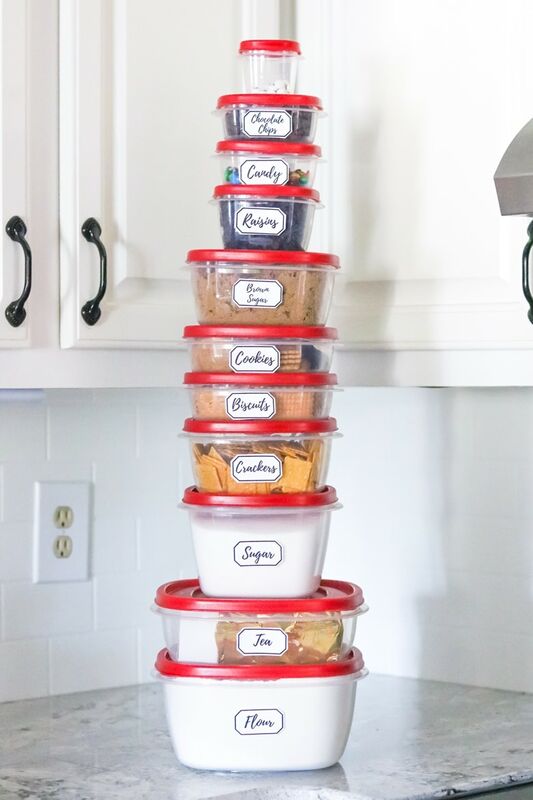 Lids snap to bases, as well as to other lids, making them easy to stack, organize, and store in your pantry. The containers are perfect for everything from pantry staples such as sugar and flour to snacks like cookies and crackers. Rubbermaid® Easy Find Lids™, available online or in-store at most major retailers, come in a wide variety of sizes to help you make the most of your space. 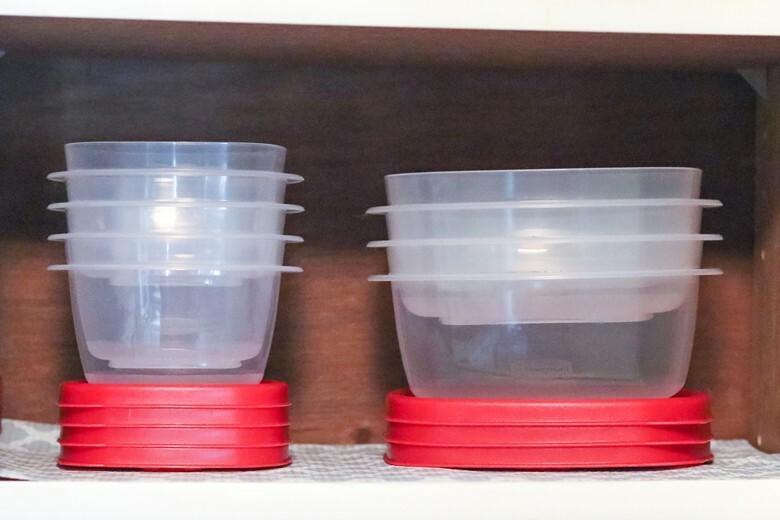 Bases and lids nest inside of each other perfectly, making Rubbermaid® Easy Find Lids™ containers perfect for stacking. I also love the fact that lids fit multiple base sizes, which helps keep things simple. For example, in the above image all 5 containers use the same lid size. Bonus: Rubbermaid® Easy Find Lids™ are microwave, freezer, and dishwasher safe so you can use them in your refrigerator and freezer as well. Once you have filled all of your airtight containers, group all of the remaining items together by category. Place each group of items in a basket or bin. I would recommend see-through baskets or bins, since they make finding what you are looking for much easier. I found these great white baskets and used them to store mixes, baby food, and my plethora of baking supplies (half of which are different kinds of sprinkles). I also used one last bin for miscellaneous items. While this is optional, I do recommend labeling at least the items that will have a permanent place in your pantry. Not only do labels help you find what you are looking for, they also help to give your pantry a cohesive look. 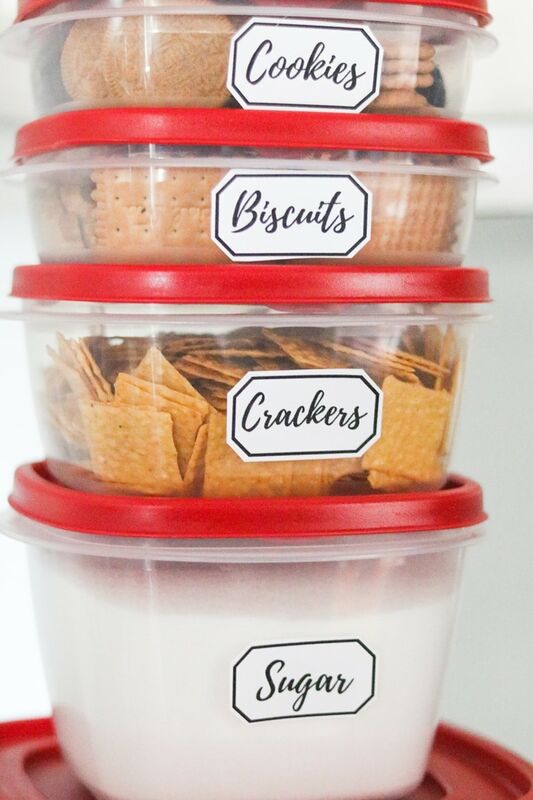 Download the smaller size pantry labels that I used on my Easy Find Lids™ containers here. 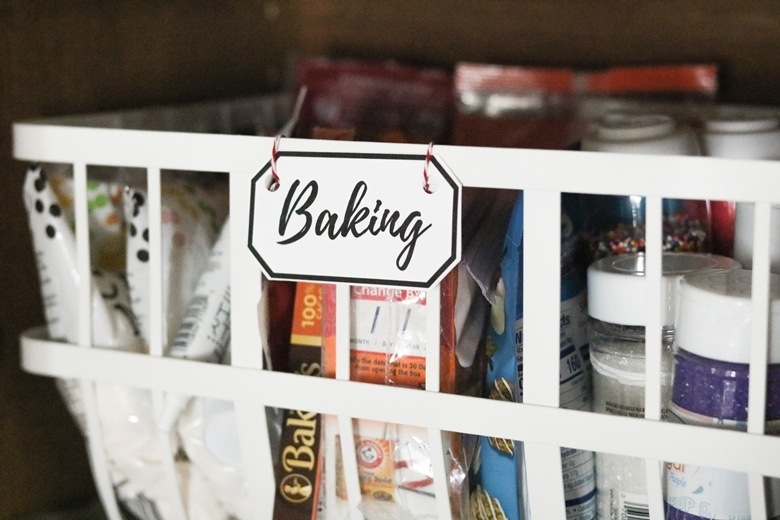 Download the larger size (category) pantry organization labels that I used on my baskets here. Both sets contains both pre-written labels as well as blank labels so that you can make your own labels as well. Finally, return everything to your pantry, placing similar items near one another. 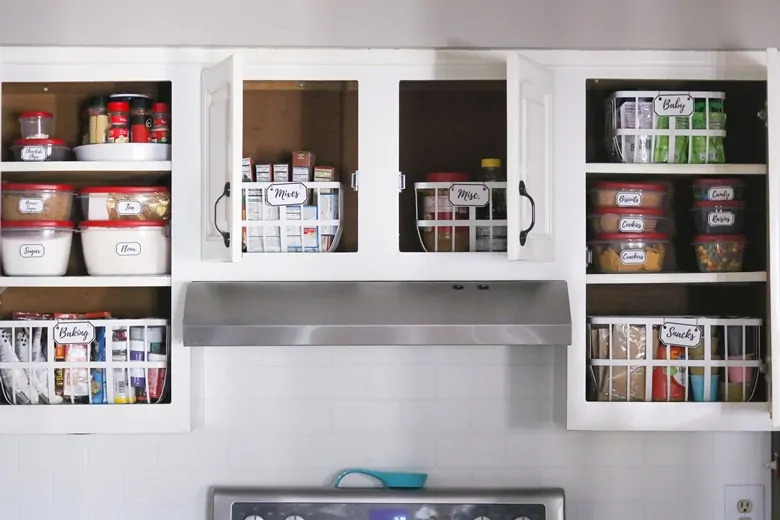 Now step back and admire your beautiful organized pantry! Need even more of a pantry update? Enter the Rubbermaid® Easy Find Lids™ Pantry Makeover Sweepstakes for a chance to win a pantry makeover valued at $5,000! Hi AAO. I try to make my content — even my sponsored content — as helpful as possible. I am sorry that you did not find this post or the printable labels that I shared helpful. Good question! I used a piece of tape to attach the labels to the containers so that I could easily remove them as needed to wash the containers or swap out what is inside the containers. With the tape they have been easy to remove and then sticky enough to stick back on later. Where did you find the baskets? I have been looking for something like that for our RV. I actually ordered the baskets from Target. They have a 2 different size options. My only complaint is that they are HEAVY. I love the way they look, but they aren’t fun to pull in and out of the cabinets all the time. I think your post was very helpful! I love the idea of the labels and I am glad that you didn’t just write a post with 1 sentence. I love the look of after and I hope to eventually have my cupboards looking as great as yours! Great post! Such great tips! My pantry is a mess. I already use Rubbermaid Easy Find Lids for leftovers and stuff but haven’t yet started using them for pantry storage. It’s really a great idea, and those labels are perfect!